J.Crew is offering 25% off all full-priced women’s and men’s styles today through April 27th! This vivid floral-print dress is definitely at the top of my list. This side-split top is the perfect easy tee you’ll wear all summer long. While I’m not sure I’m totally on the Birkenstock bandwagon yet, I’d absolutely choose this pair if I decided to hop on. Use code GOSHOP at checkout. Take an additional 25% off sale items at Neiman Marcus today only! This bright orange dress is a perfect frock for spring/summer weddings. If you love the color green and you like bold prints, check out these fun Oscar de la Renta wedges. Speaking of Oscar, these pink tassel earrings are also on sale! For a pair of earrings that are sure to catch the light, these bright gold Herve Van Der Straeten earrings are a gorgeous choice (also love this pair!). There’s nothing better than finding a bunch of Equipment on sale! THE OUTNET has every silk piece you need for summer – this pair of minty fresh pajamas is calling my name, but I also could go for this chartreuse-striped shirt. Both items are so cheerful! This printed blouse is another winner. Click here to shop all Equipment at THE OUTNET! Love your picks, these dv sandals would be perfect for summer. As I scrolled down all I saw was “Equipment” and “The Outnet.” Heading over there right away! That flask bracelet is the best! That red maxi is perfection! Might have to scoop it up for an upcoming trip! 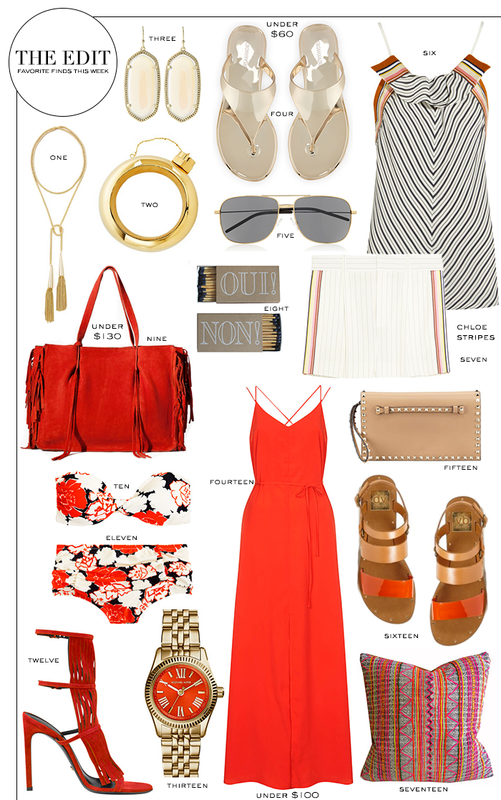 I love that J.Crew bikini and Equipment at the Outnet! I’m there! That bikini and those heels, gasp, amazing! I NEED the watch. Like…now. That fiesta accent pillow is so festive and vibrant! Would be the perfect accessory for a neutral couch or even for an outdoor seating area! Love the Kendra Scott necklace! Love this edit. So many pieces I would definitely rock. so many beautiful picks merritt. I want everything but especially numbers one, three and eight! always love all your picks! that watch with the red face is gorg! this post is bound to get me in trouble! That maxi is stunning, as are those DV sandals, and the bag under $130?! Yikes. And, I only clicked on every single thing you mentioned… you’ll appreciate my post today (all about Birkenstocks! LOL. I’m really warming up to the idea of a white pair). I can’t believe the BCBG sandals are only $60. That’s the perfect pool shoe! I bought a cute Milly coverup this weekend and these flip flops would be perfect! I love finding new beauty items, especially learning how to use it too! It gives such a beautiful natural look! Love 9 and 14! Amazing picks as always… You have impeccable taste! Loving this camel and red color combination. Those sandals! #16 is a big yes for me! Love one, three and six! So pretty and perfect for spring! wait a second that bag is AMAZING…red one! I am always such a sucker for fun matchboxes, and that Oui/Non set is just my style! I am also loving that fun red and white floral print bikini from J.Crew, I might have to scoop that up during the sale. I feel like it would be a great print for the summer, especially for the 4th of July! Love your roundup as usual:) I got a similar pair of flat sandals and can’t wait to start wearing them! You find the BEST stuff! How cute is that swimsuit!